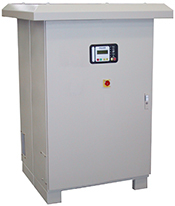 The APOJET AJT step down transformer (Gatebox) is designed to step down the high 400Hz transmission voltage supplied by a centralised Ground Power System. The system can be installed either on the apron or beside a boarding bridge. It is also available as a two-cabinet version. Using the latest state-of-the-art technology and newest trends in the power electronics field and digital control, the APOJET AJT offers the best solution for aircraft ground power supply systems.